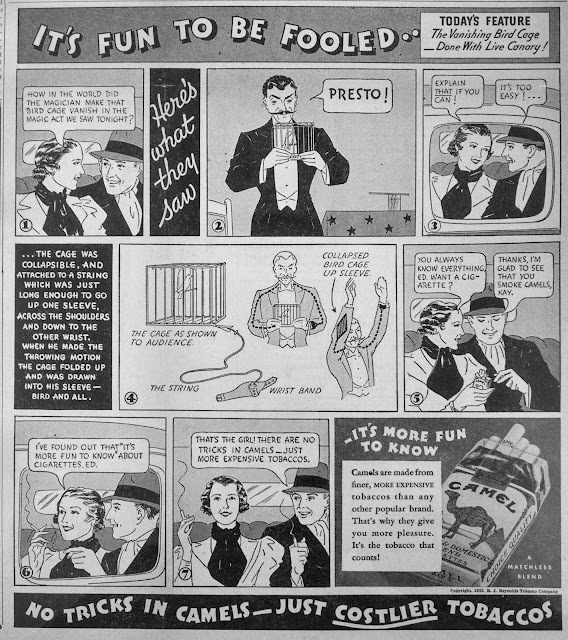 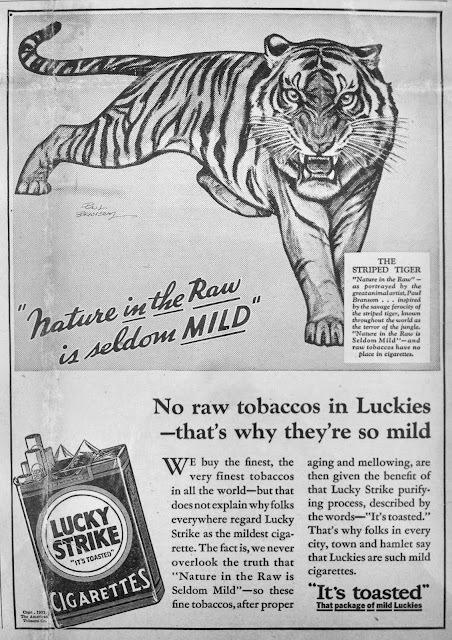 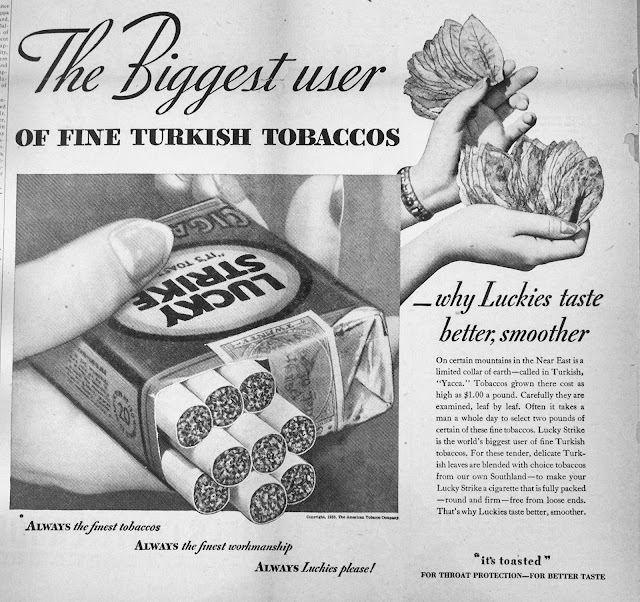 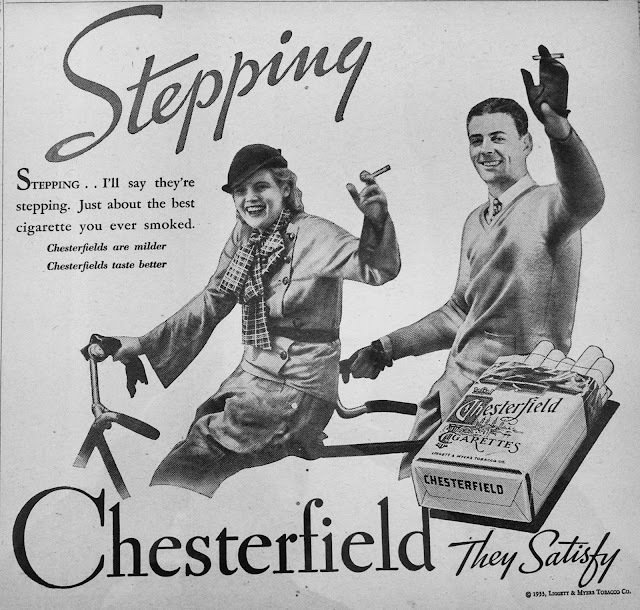 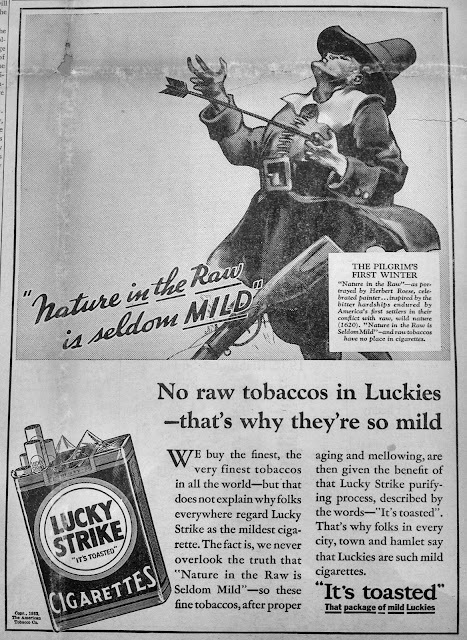 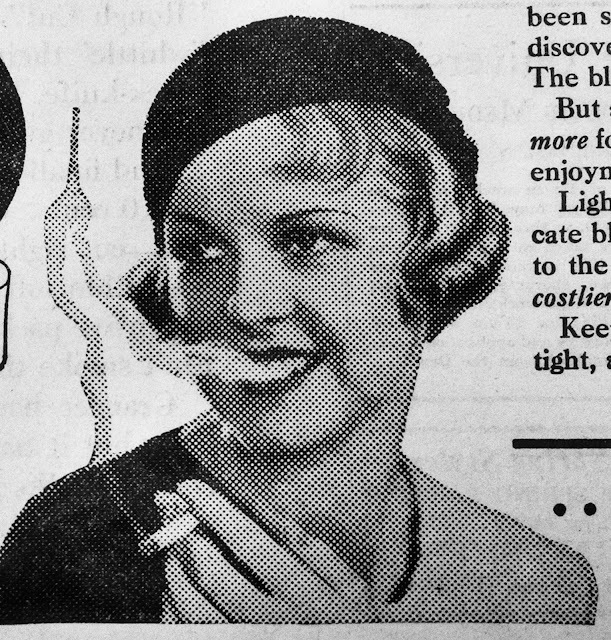 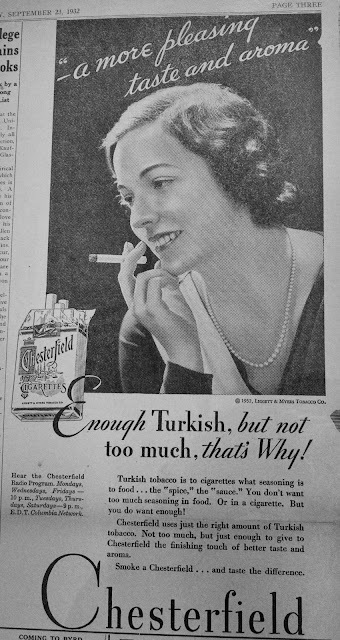 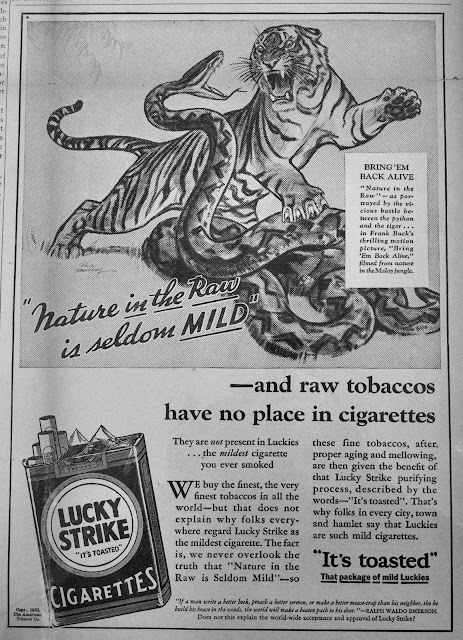 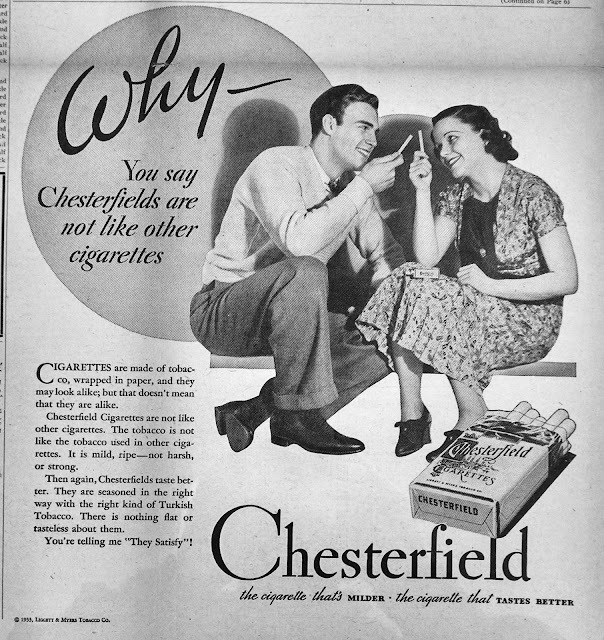 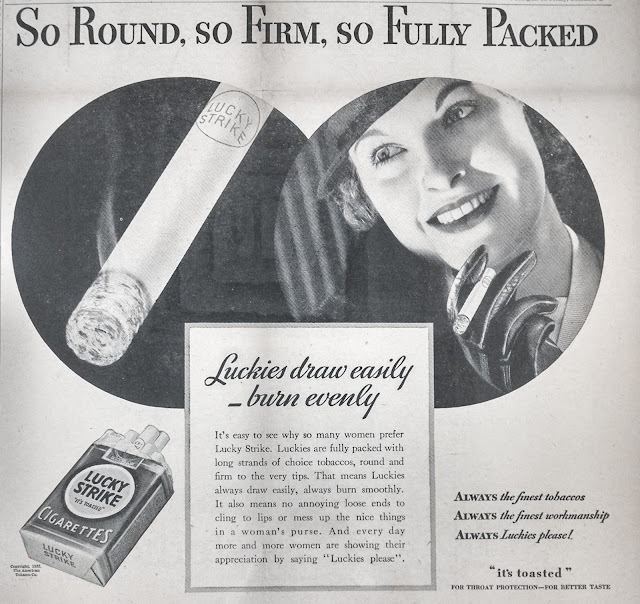 Although Lucky Strike was first major tobacco company to appeal to female smokers, it did not take long for other companies to follow their example by including images of “independent” and attractive women in their advertising. 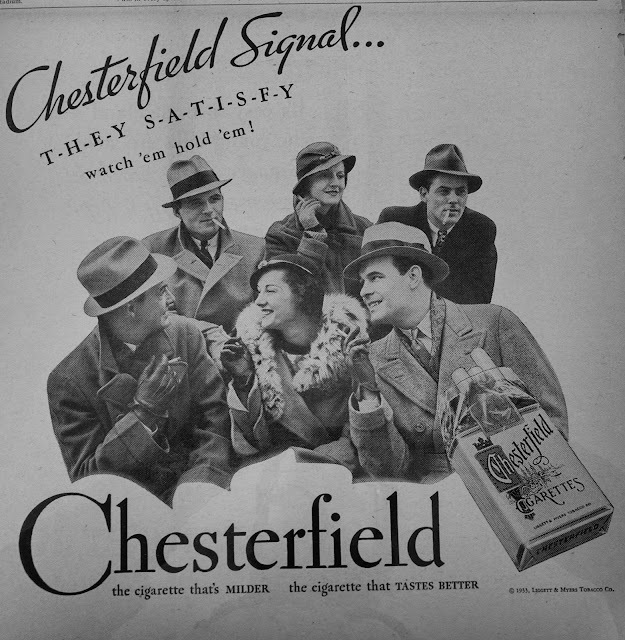 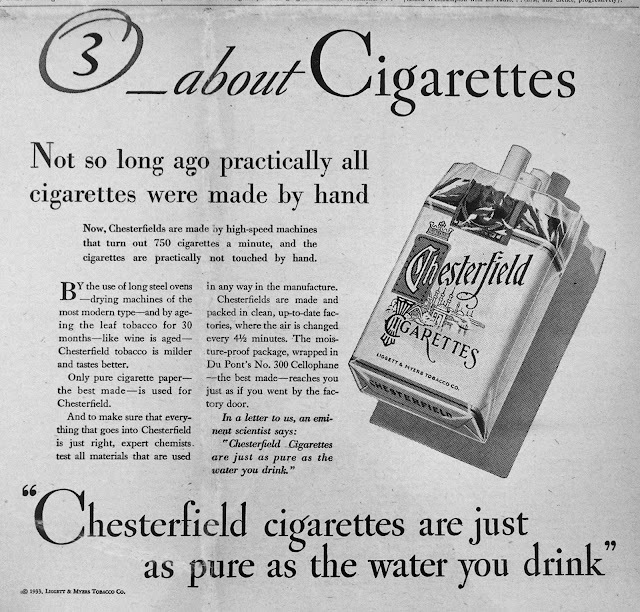 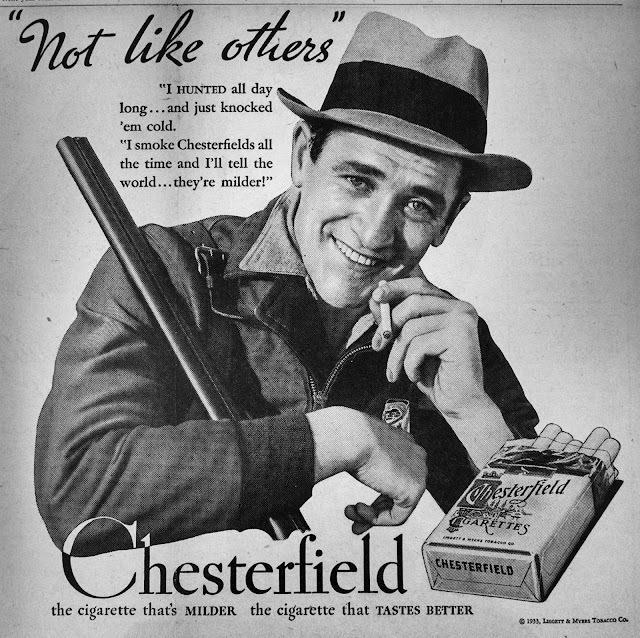 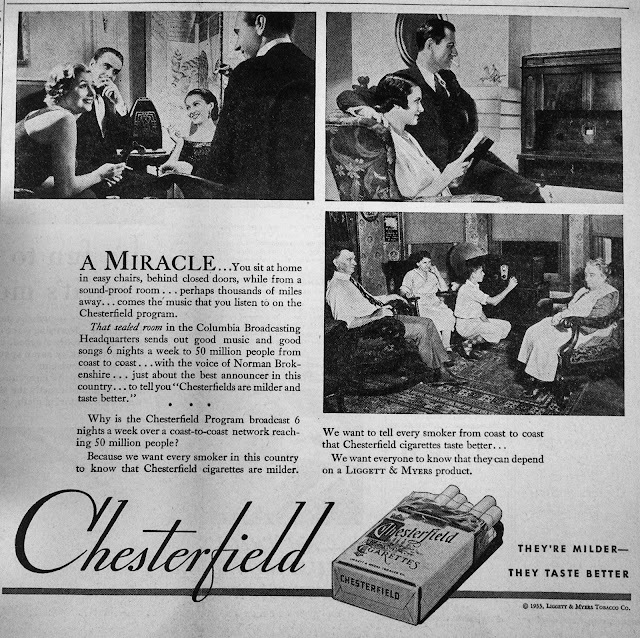 Here are several samples from the folks at Chesterfield. 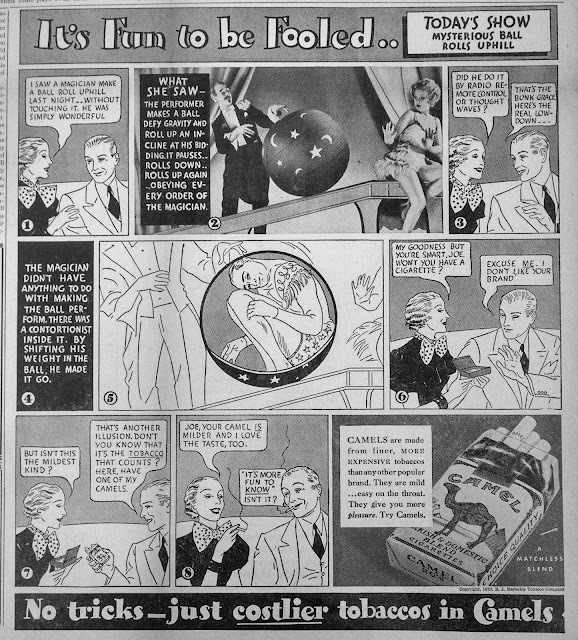 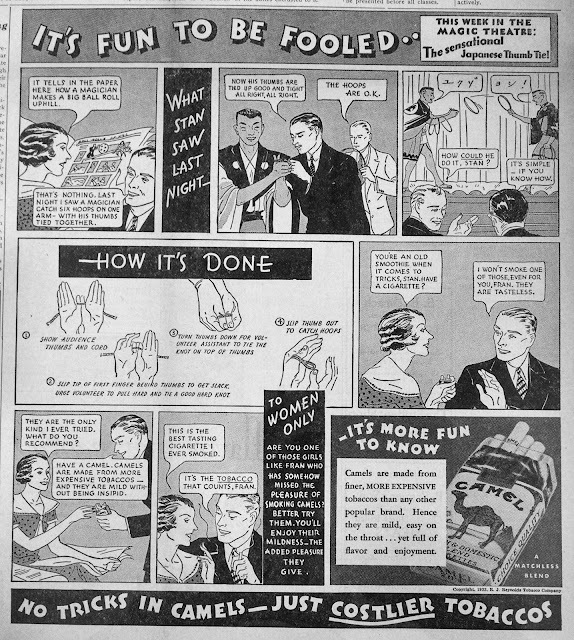 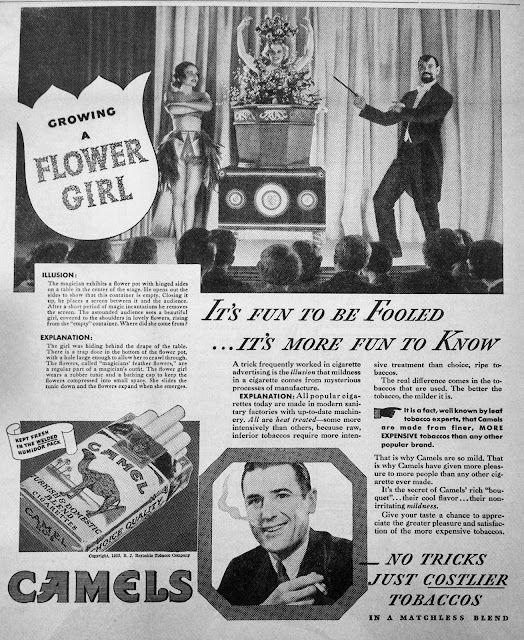 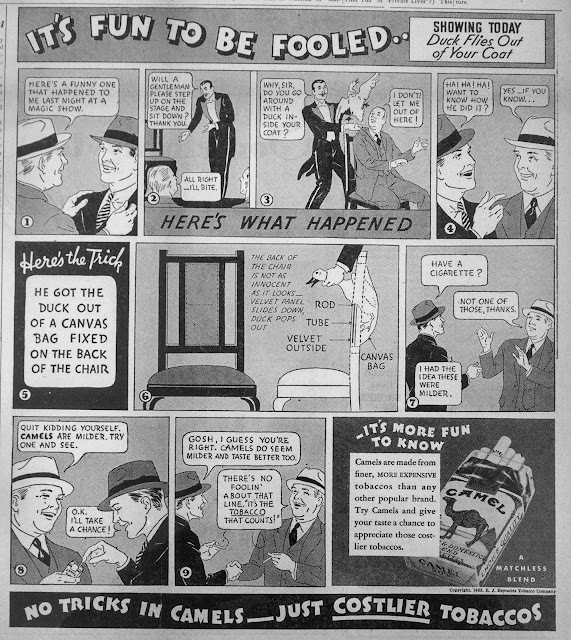 In February 1933, Camel Cigarettes began a campaign that ran for several months which betrayed the magician’s promise to never reveal how a trick was done. 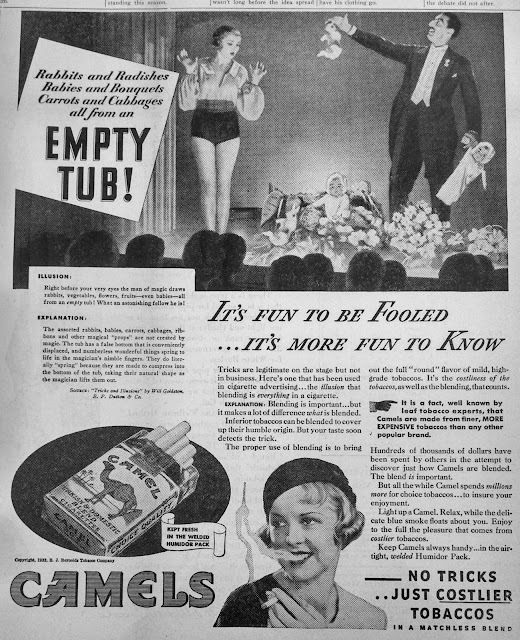 In these advertisements they described the illusion, then how it was accomplished. 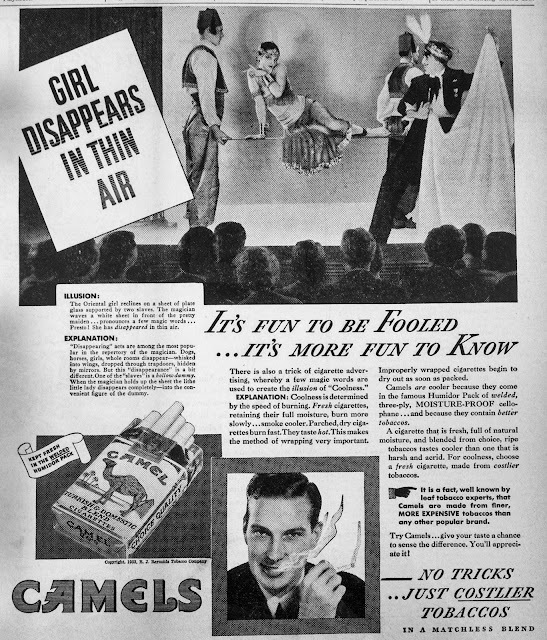 When you describe illusions as a method of selling cigarettes, there is some sleight of hand going on. 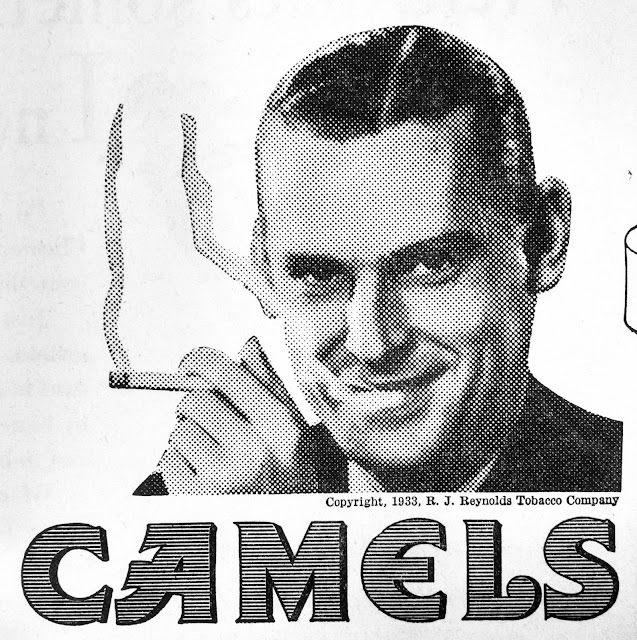 As tobacco companies struggled with how to depict smoking in their advertising, Camels tried for a short time to show the smoke with halftone. 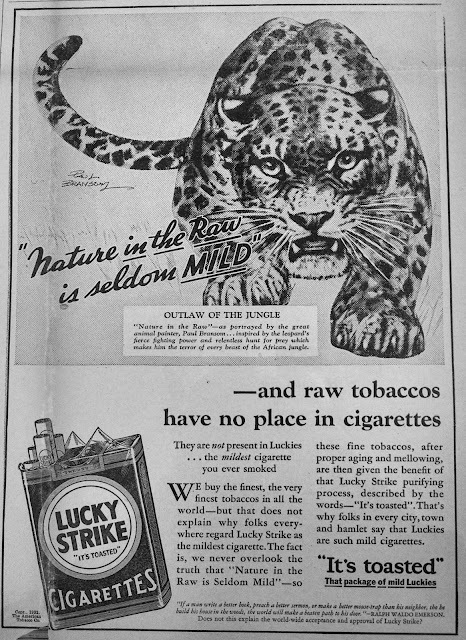 The result is unusual to say the least. 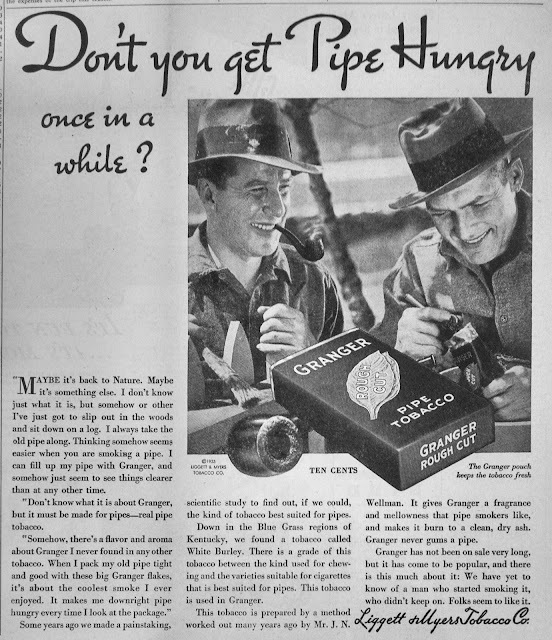 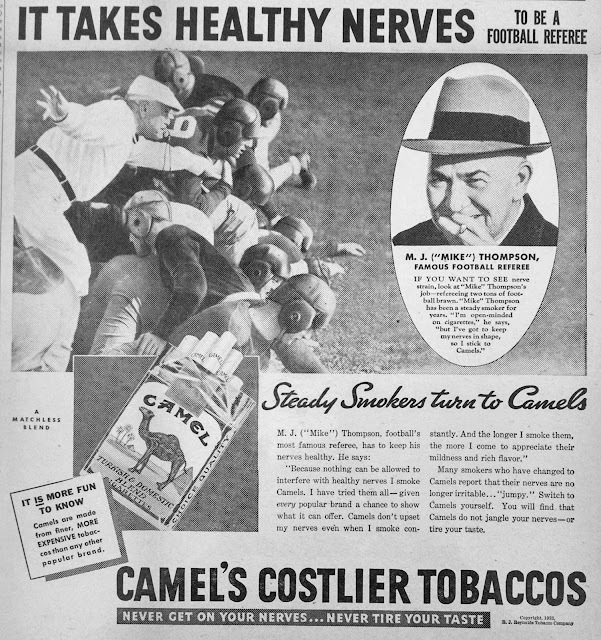 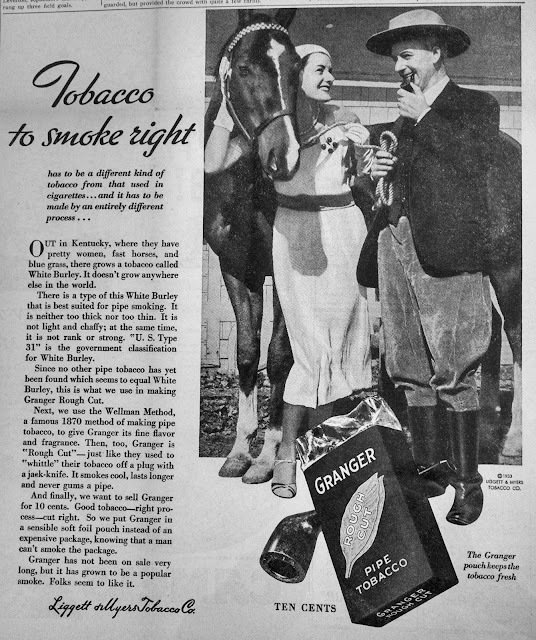 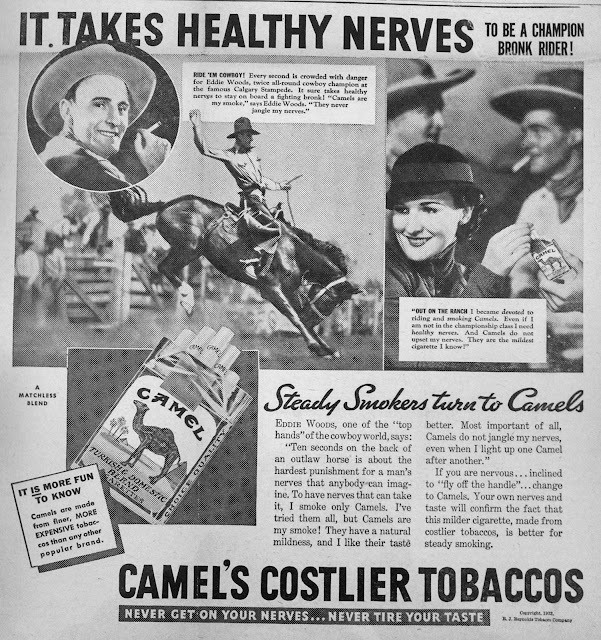 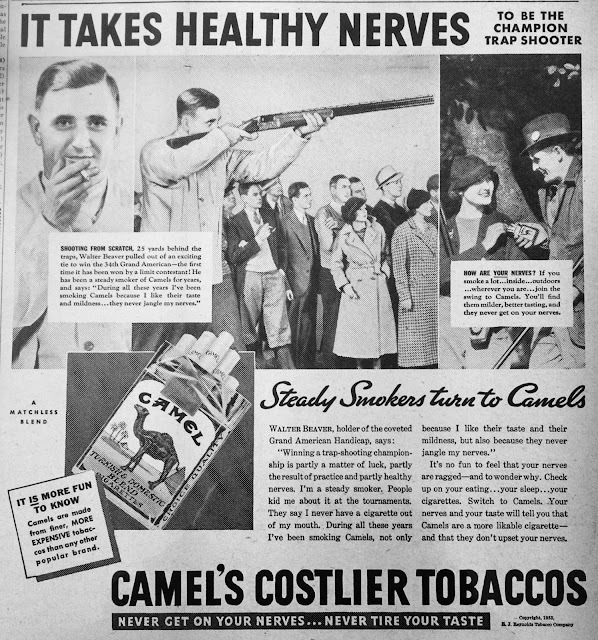 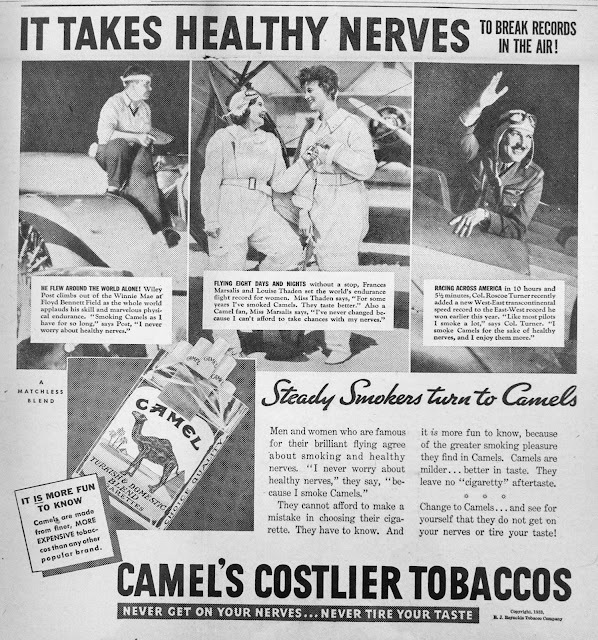 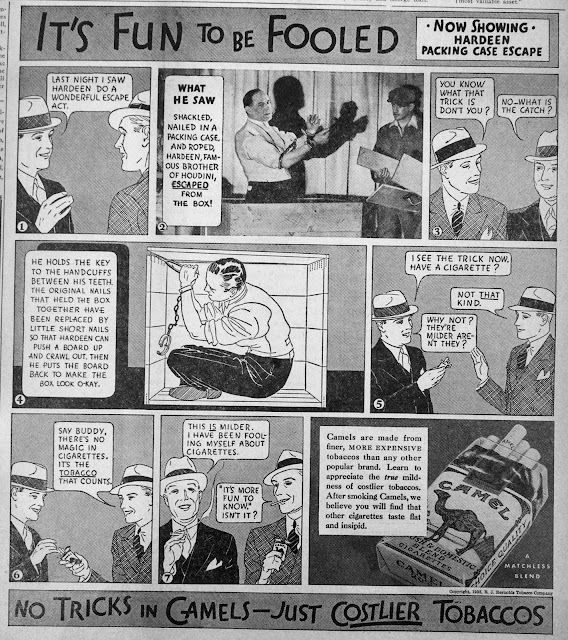 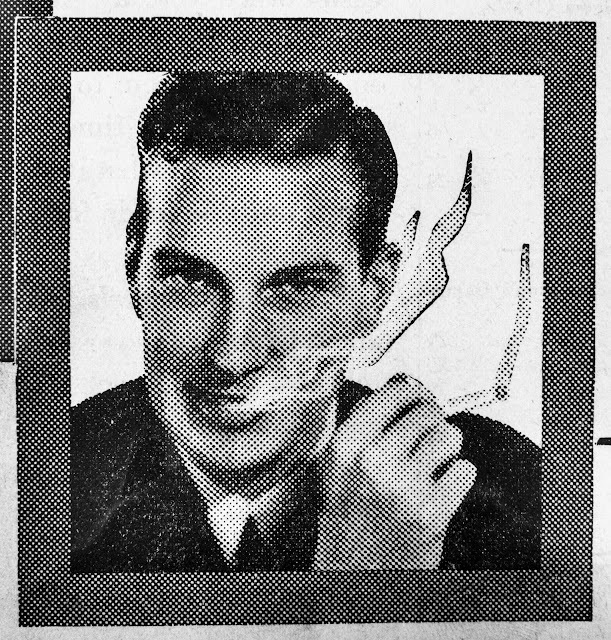 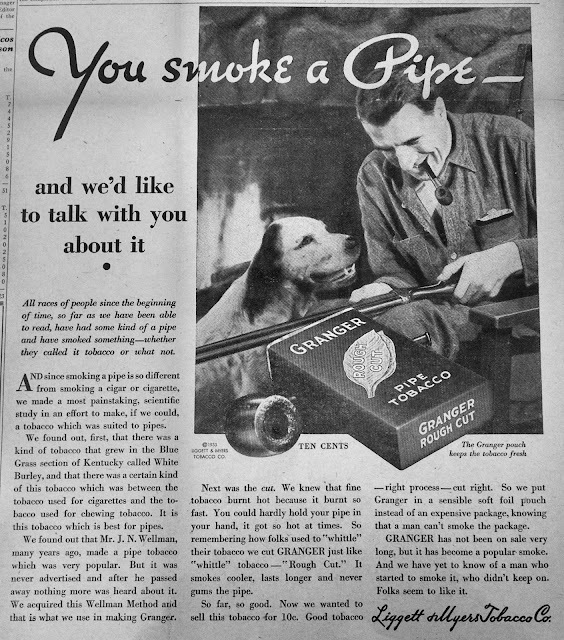 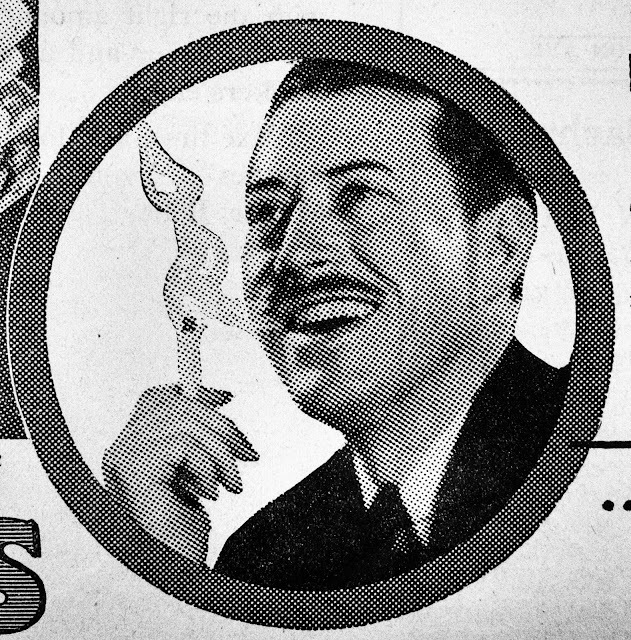 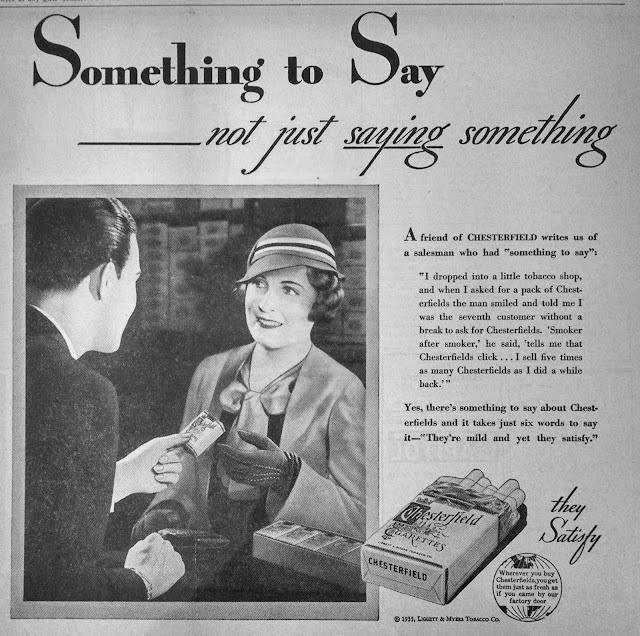 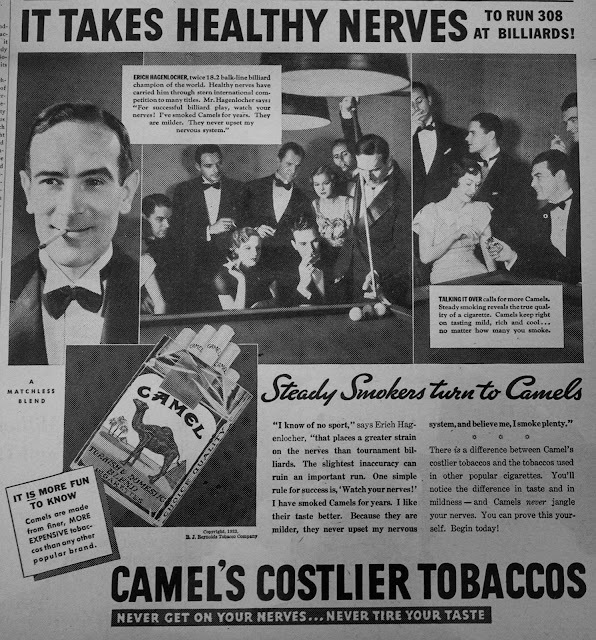 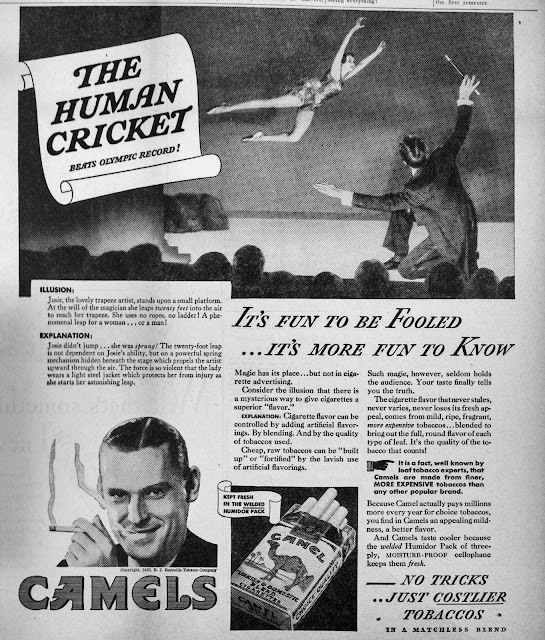 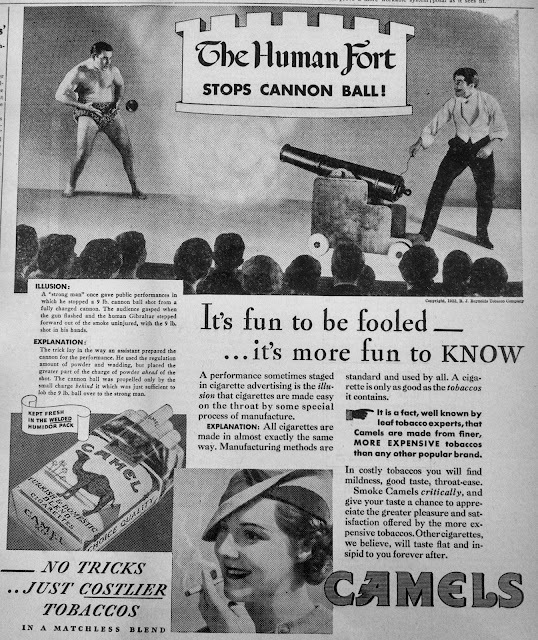 In November 1933, Camel’s campaign about “Healthy Nerves” featured stunt pilots, cowboys, champion athletes, and others explaining that Camels didn’t give you “edgy nerves or make you “jumpy” like other cigarettes. 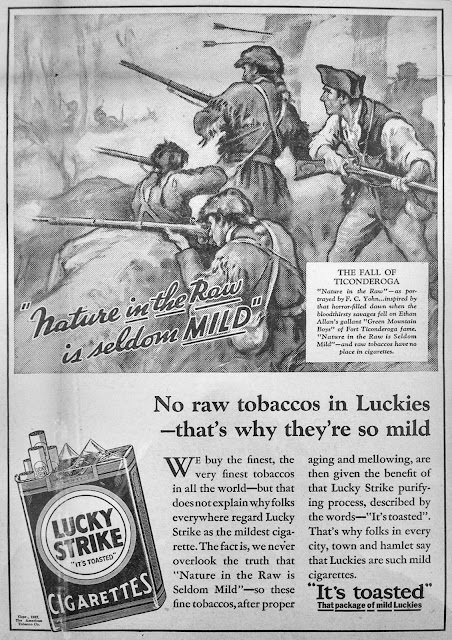 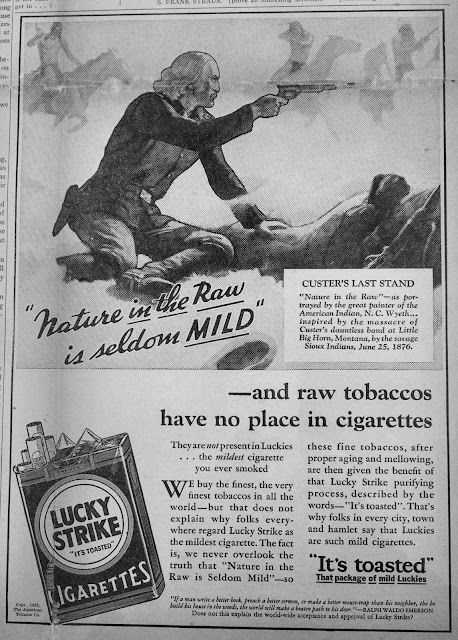 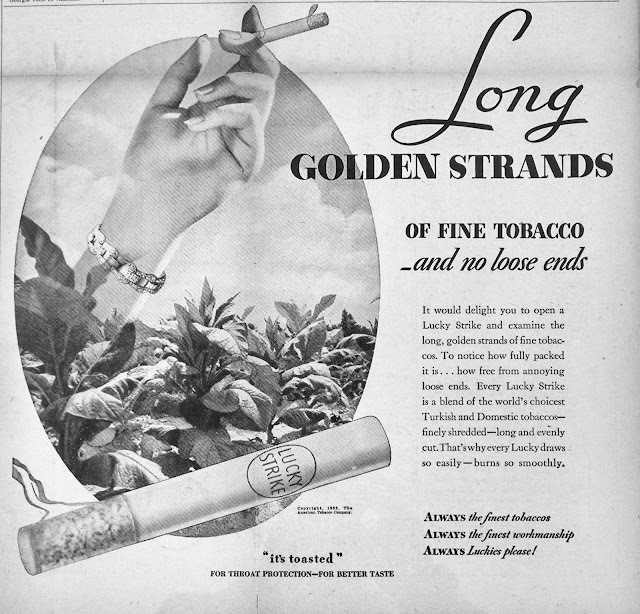 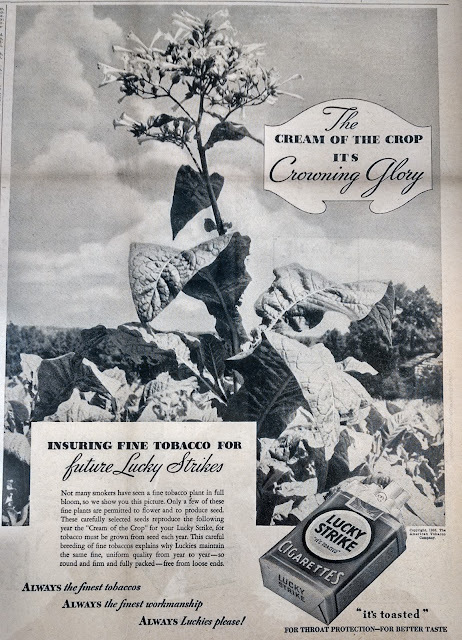 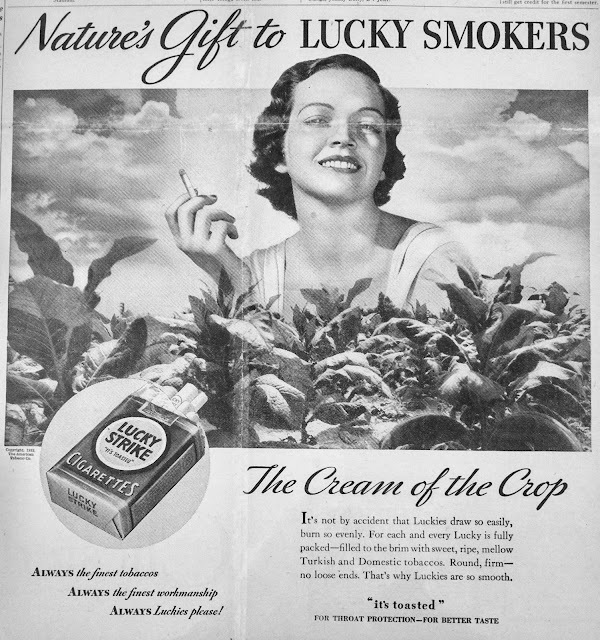 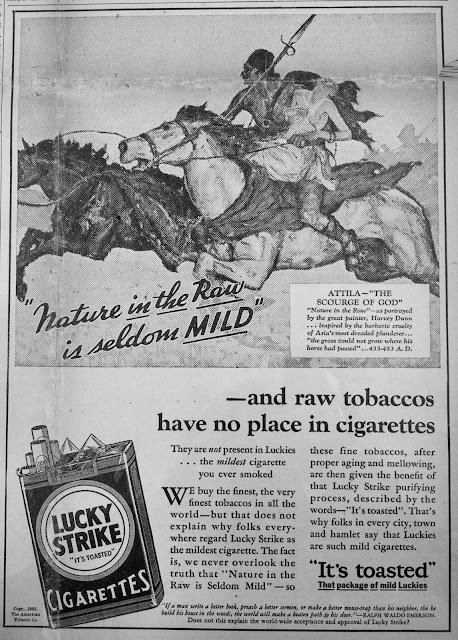 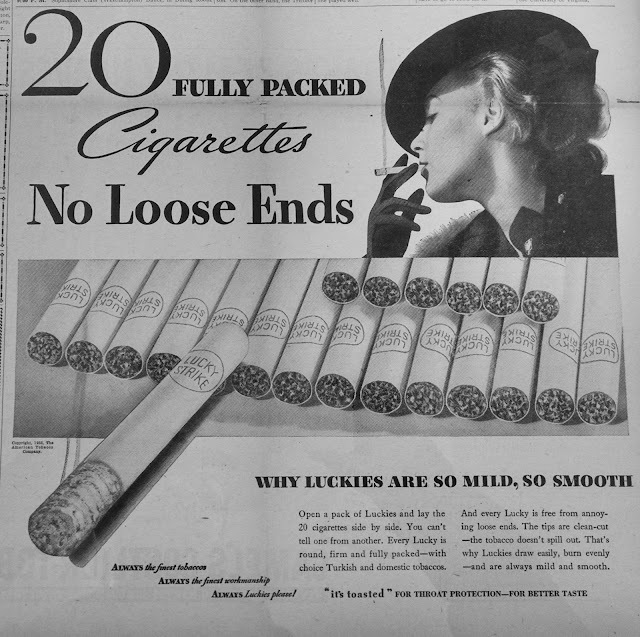 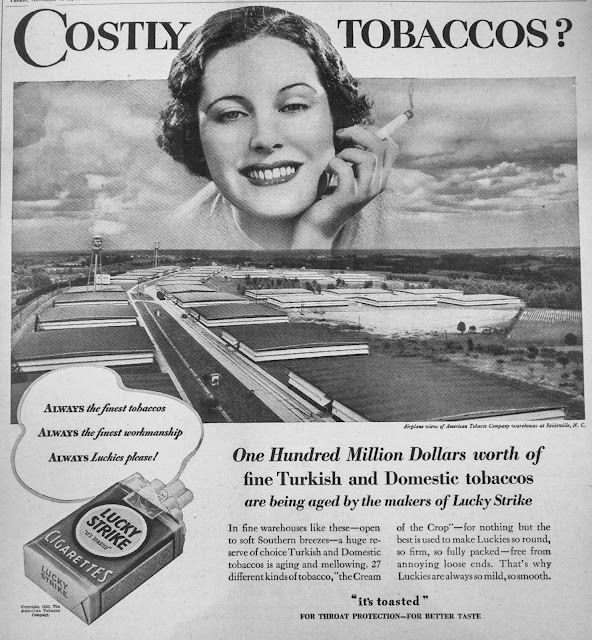 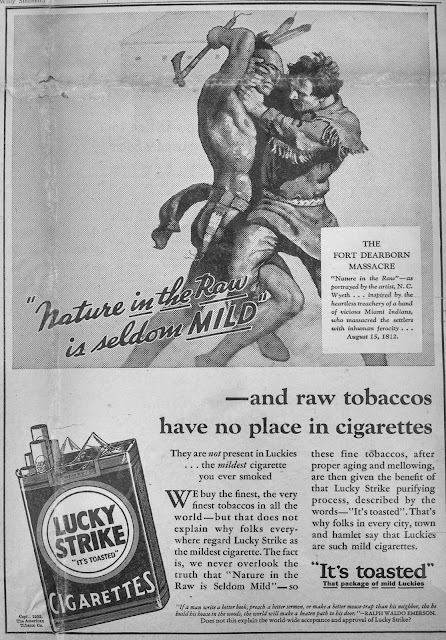 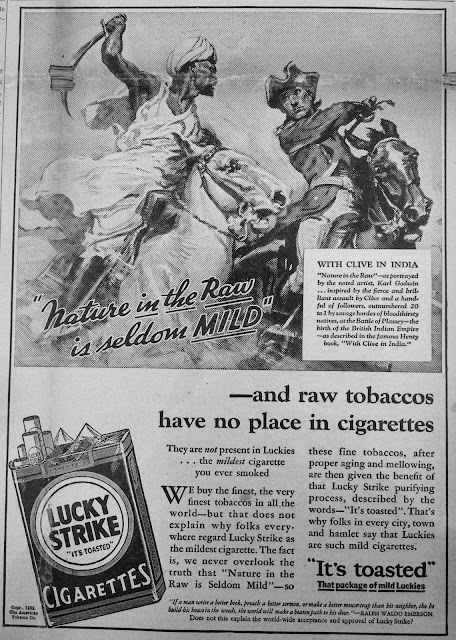 At the end of 1933, Lucky Strike utilized two campaigns, one featured photo montages of women and tobacco fields. 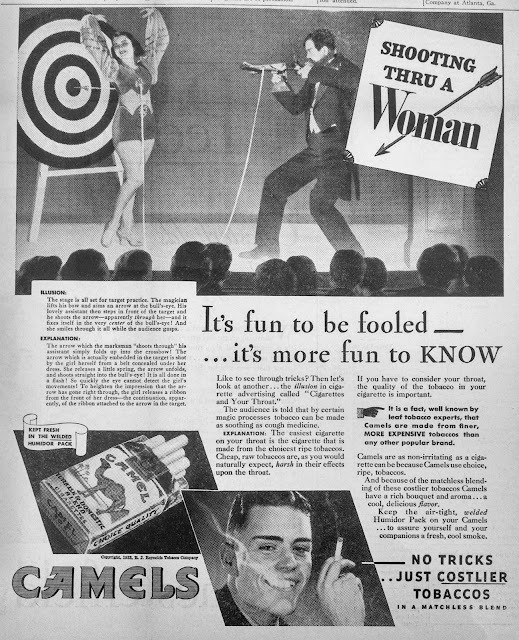 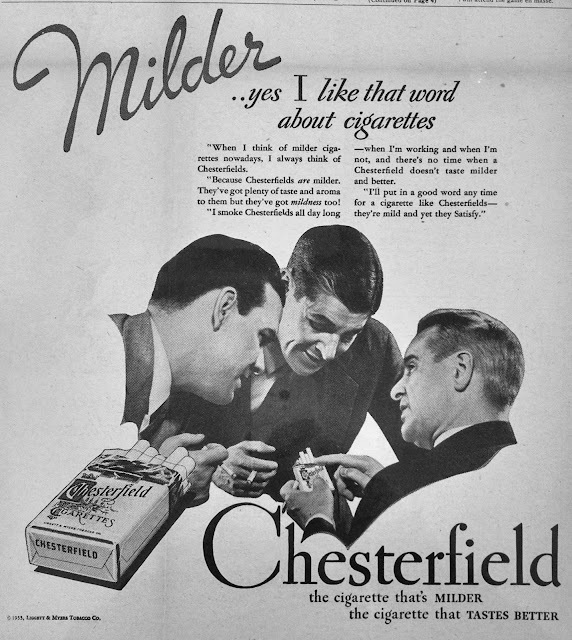 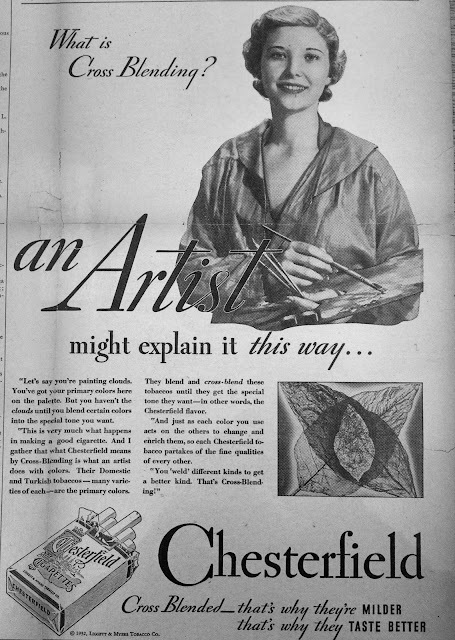 These ads used a photo process of dodging and burning that became popular in the early thirties, a pre-Photoshop collage technique. 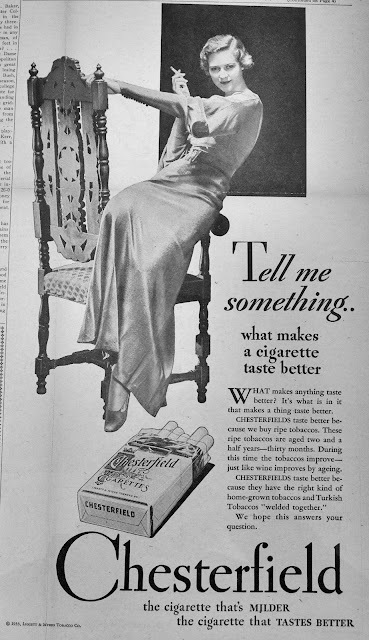 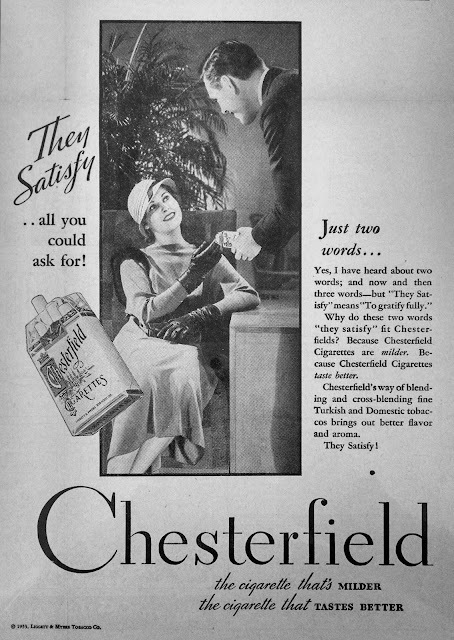 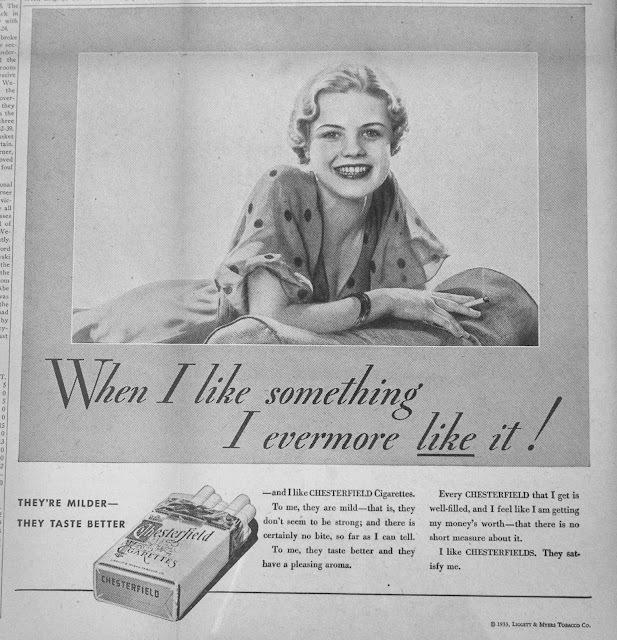 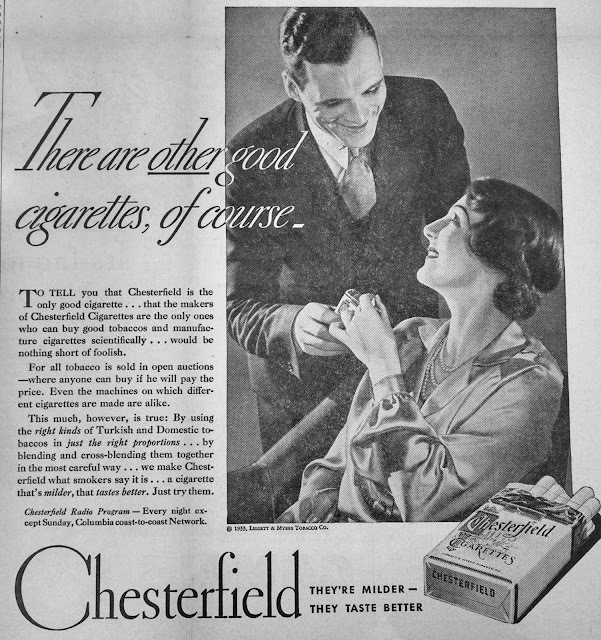 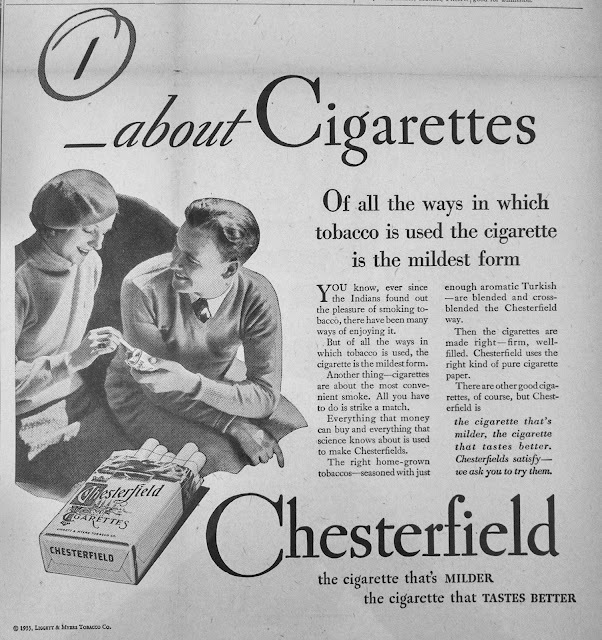 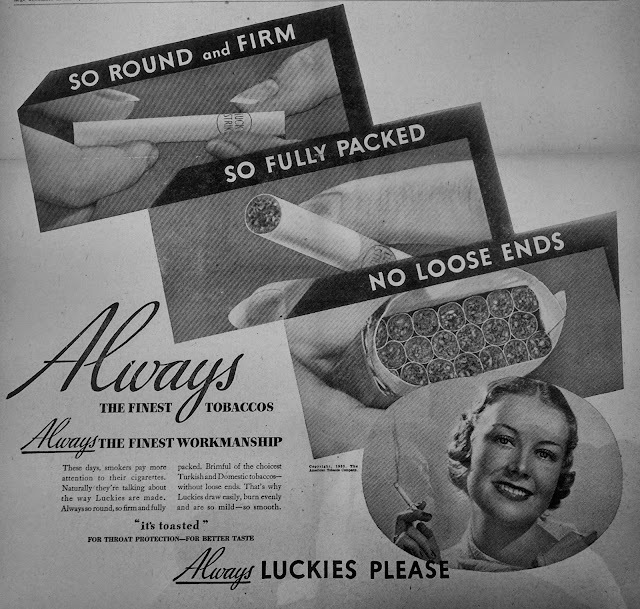 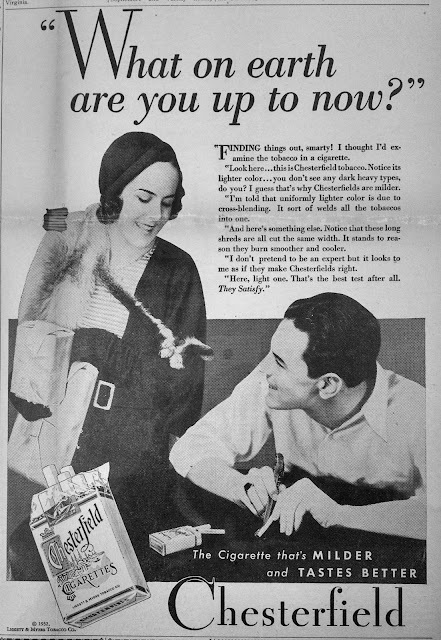 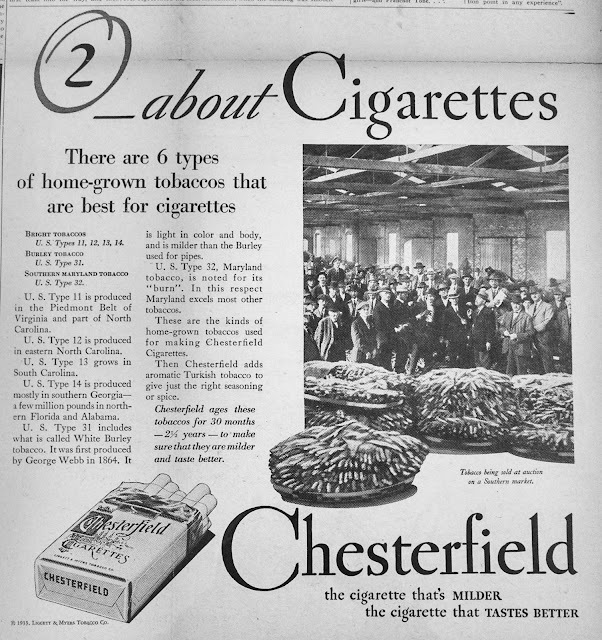 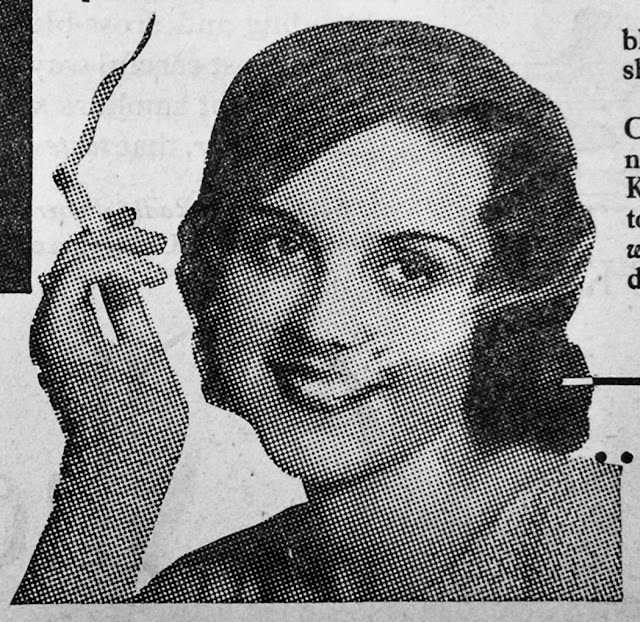 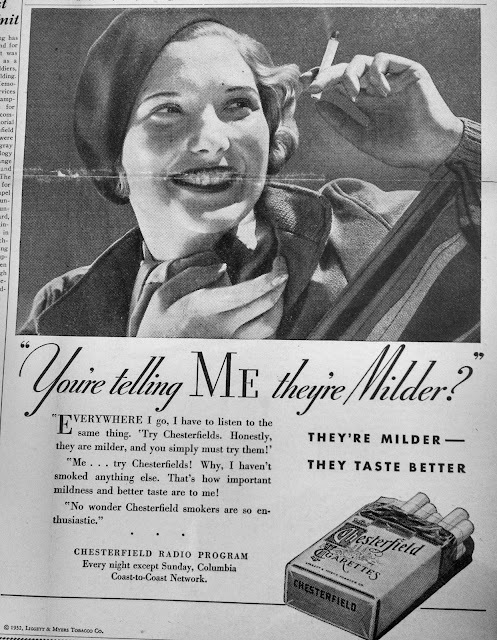 The other campaign featured women and the slogan “So Round and Firm, So Fully Packed, No Loose Ends” which one could say described the cigarettes but also seems to employ some double entendre. 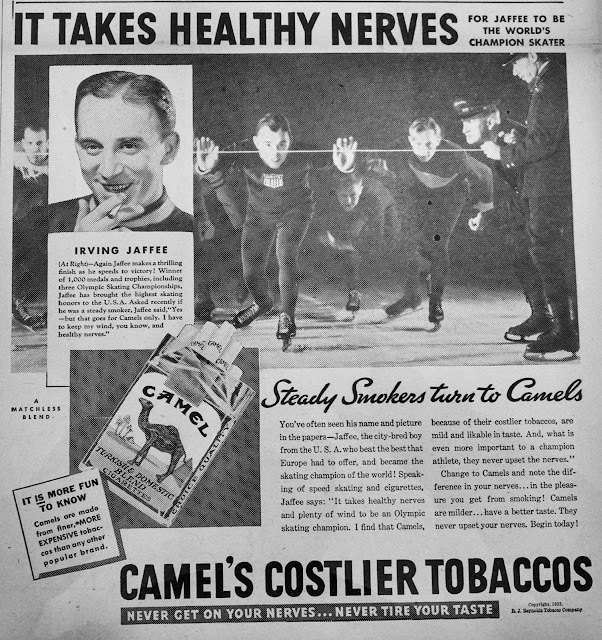 A challenge to Camel’s claim to use “costlier tobaccos,” Lucky Strike claimed to have on hand $100 million in tobacco curing in warehouses. 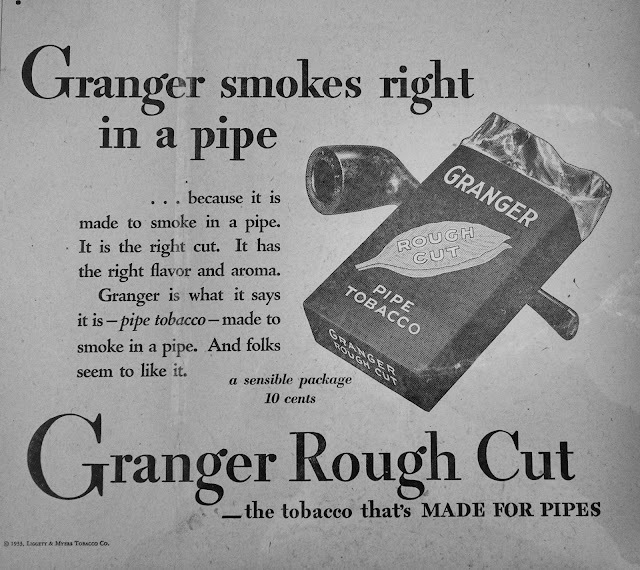 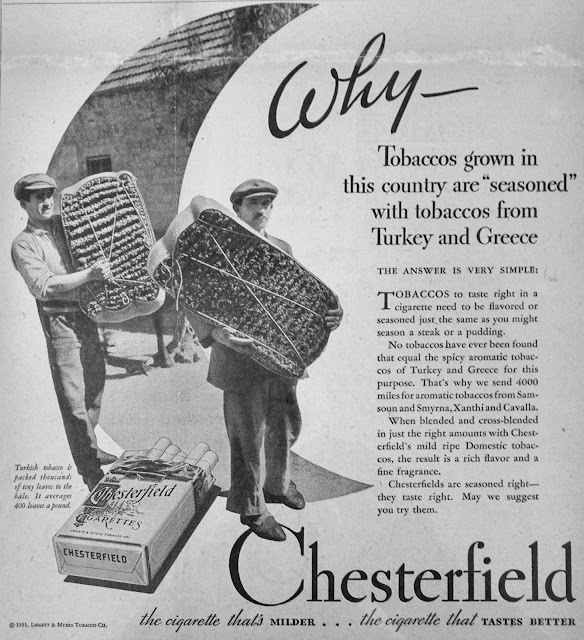 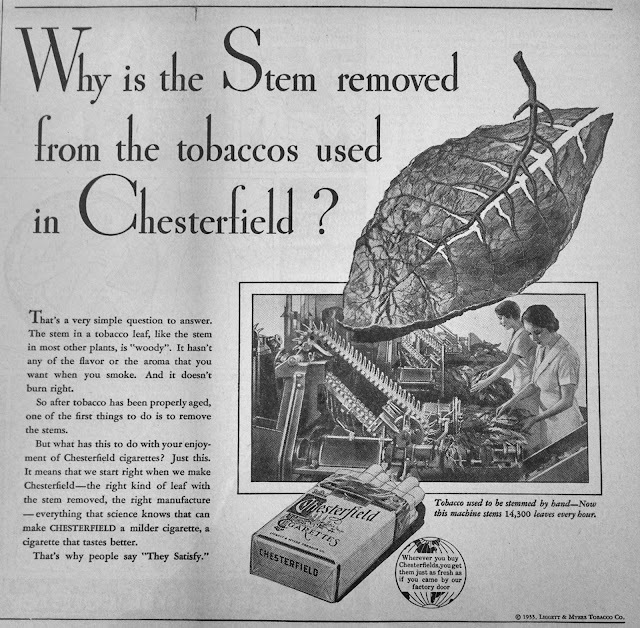 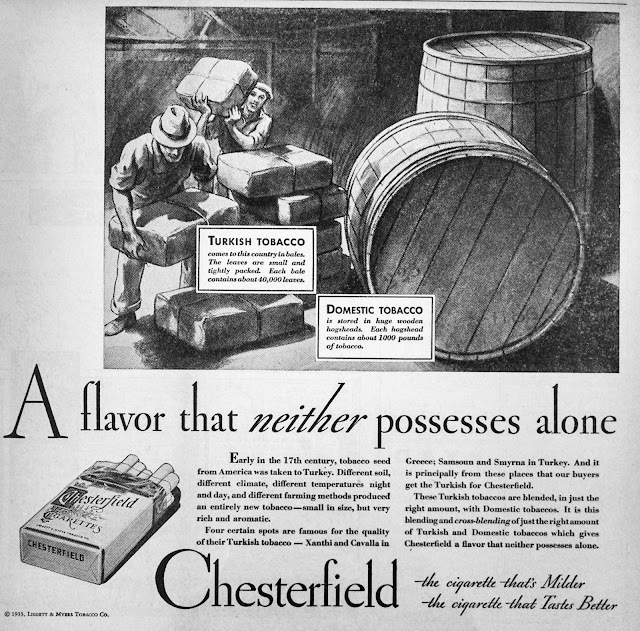 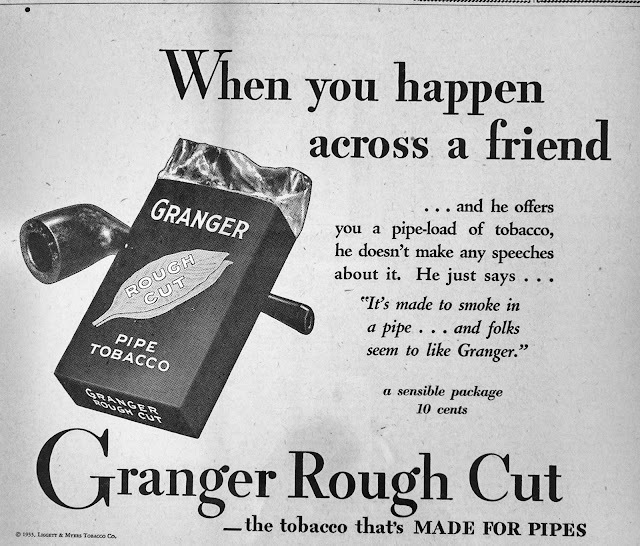 Posted by Silver in Advertising, Tobacco. 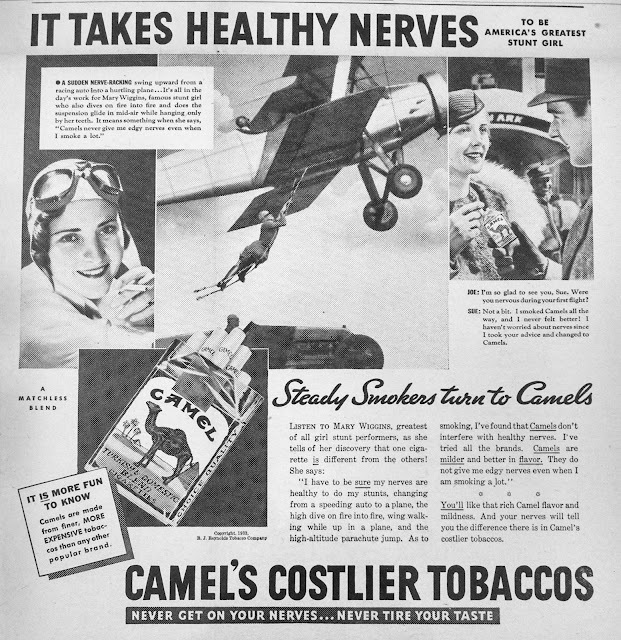 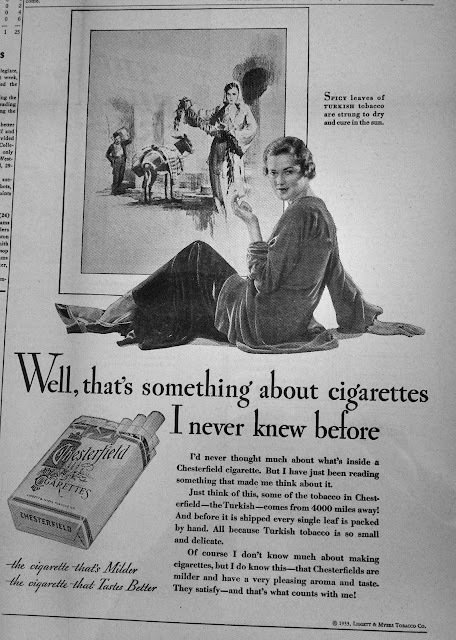 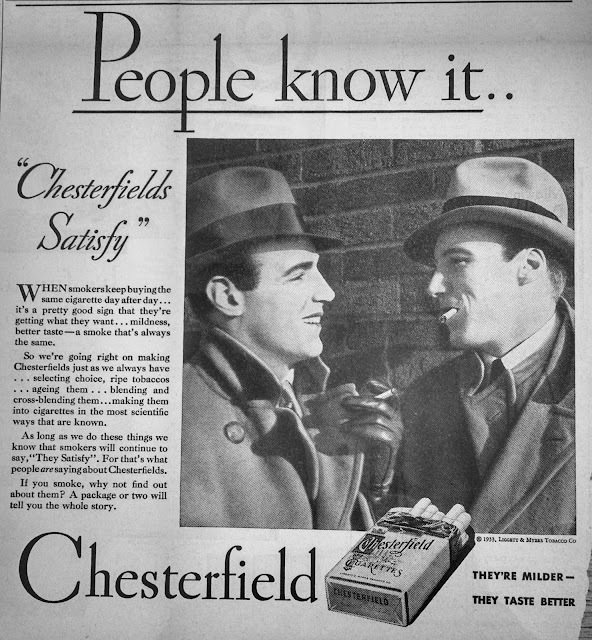 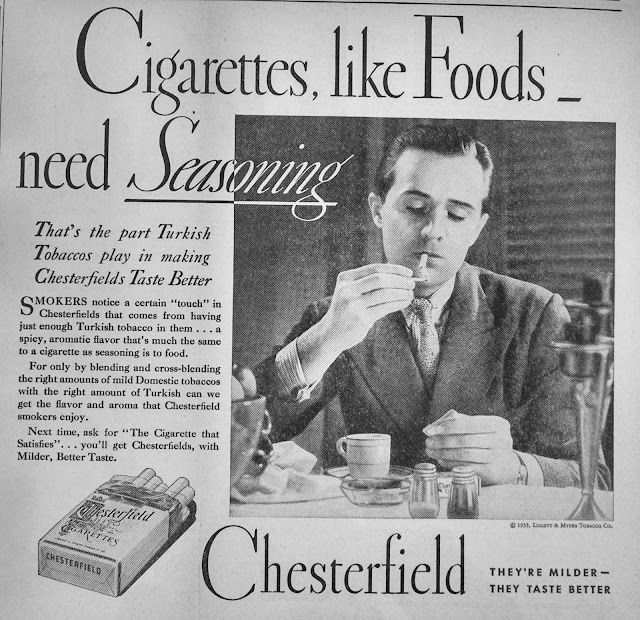 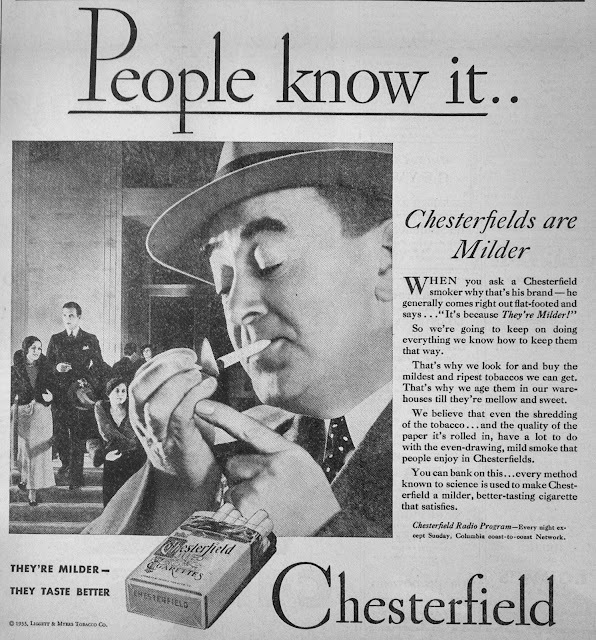 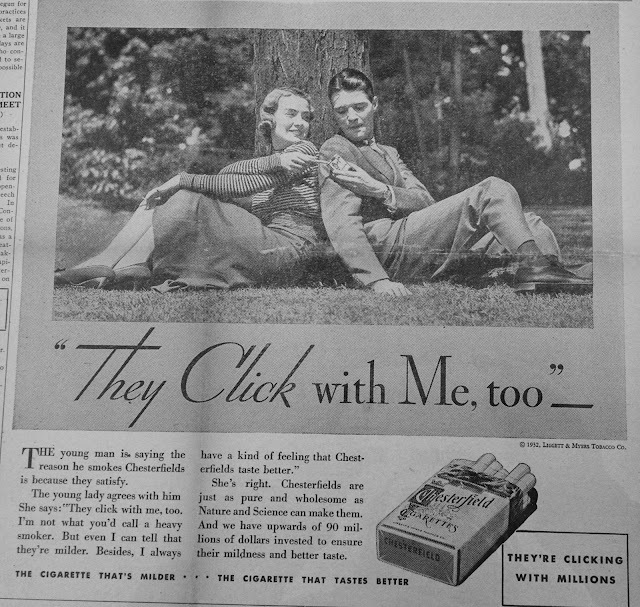 Tags: Ads, Advertising, Camel, Chesterfield, Cigarettes, Lucky Strike, Newspaper, Richmond, VA, Virginia, Women.